Nithya Menon essayed the role of Former Tamil Nadu Chief Minister Jayalalithaa in her biopic 'The Iron Lady' which is being directed by Priyadhaarshini. Makers unveiled the First Look Poster on the 2nd Death Anniversary of Amma. 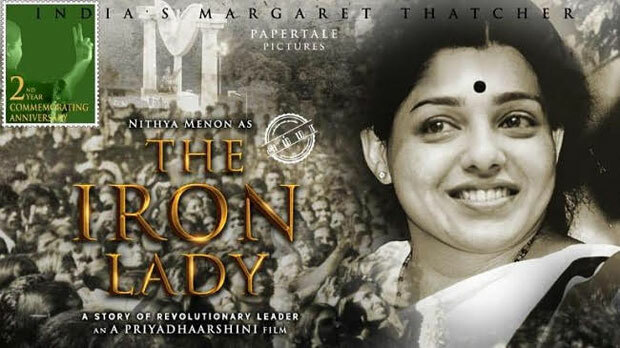 First Look of 'The Iron Lady' had only given scope for criticism as it appeared more like a morphed picture of Nithya Menon rather than official poster. There is still ample time left for Filmmaker to overcome the shortcomings. This biopic focusses mainly on the political career of Jayalalithaa, since she associated with AIADMK. 'The Iron Lady' releases on February 24th, 2019. KGF Trailer 2: Classy N Massy!